I'm the author of a book of poems ("Witchcraft", 2008). Among my current projects are a second book of poems, a novel, and short fiction. I've had a biweekly column in an Indian newspaper for almost two years now, which I also archive on my blog. Since "Witchcraft", my poems have recently appeared in Drunken Boat, Danse Macabre, Muse, White Whale Review, Clementine, A Cafe in Space, Poem2Day, Pratilipi and Pyrta. Read more about me and my work at www.sharanyamanivannan.com. To number among my graces the ability to chronicle my own life is something I hope I never stop being thankful for. That this chronicling – these poems, the lightly disguised fiction, the guileless essays – finds an audience never ceases to amaze me, not because I labor under any false sense of humility, but because my work is so utterly personal. That it resonates for anyone else at all is deeply affirming. As with many others, writing also brings freedom -- but the way I see it, not so much the freedom to express or to make my mark, but the freedom to live. Something about the nature of life itself changes when one approaches it through the fulcrum of art. The knowledge that all of life can be alchemized intensifies it. Some say there is a danger in living with the grandiose meta-narrative in mind. But to me, it is not about the meta-narrative: it is about the moment. As a writer, I am blessed as much by the ability to bear witness as I am by the experience itself. Michael Ondaatje, Jeannette Winterson, Isabel Allende, Ai, Sandra Cisneros, Dorianne Laux, Louise Erdrich, Anais Nin, Nicole Krauss, Barbara Kingsolver. Whoops, my bad, i see it was posted today! My pleasure Sharanya, however, I submitted it to Marcelle a while back and I havent seen it published on Fictionaut as yet. I assumed she thought it was no good and decided not to publish it! Let me know if she told you otherwise. Thanx! Sharanya, just wanted to say hi on your wall and how much i love your work. Your profile expresses my thoughts too about my writing being personal and thinly disguised fiction. Looking forward to seeing more of your work and I would be so pleased if u would critique mine. thanks, my lady, for your favourable comment on "the serious writer and his beef whistle". your blog, matt's right, looks fantastically interesting. is the story "venus flytrap", i wonder, a chance publication or in any way related to the recent genital turmoil that has engulfed this shore? cheers! Howdy, Sharanya. Your blog looks *very* interesting. 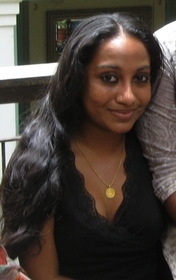 You must log in to write on Sharanya Manivannan's wall.